Today antibiotics are often prescribed empirically based on a patient’s symptoms. Such treatment is very often ineffective and aids the development of antibiotic resistance. 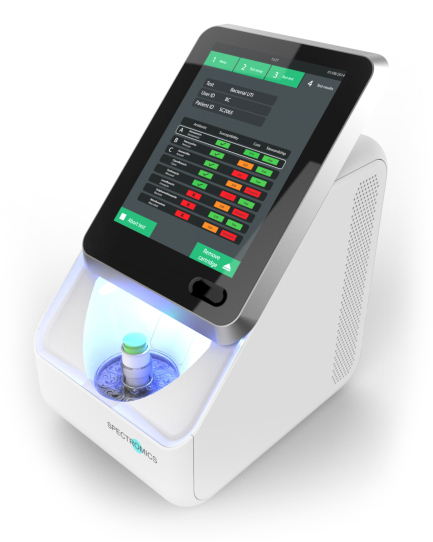 The Spectromics solution is a diagnostic that can guide antibiotic treatment. Simple and rapid to operate, it is ideal for use at the point-of-prescription. This powerful new tool from Spectromics has been designed to help in the fight against growing levels of microbial resistance to antibiotics – one of the world’s greatest challenges. The development takes the form of a fast, simple, accurate and cost-effective test for bacterial infections that identifies anti-microbial susceptibility/resistance during a patient appointment. It then provides guidance on the most effective treatment for a particular pathogen and which drug to prescribe. The test, which is based on novel technology from The University of Manchester, allows rapid, more targeted use of antibiotics, eliminating ineffective empirical prescriptions. This means that, because prescriptions are only issued when susceptibility is verified, healthcare professionals can administer the right antibiotics on a patient’s first presentation.